A plastic-free plant-based bottle brush set. 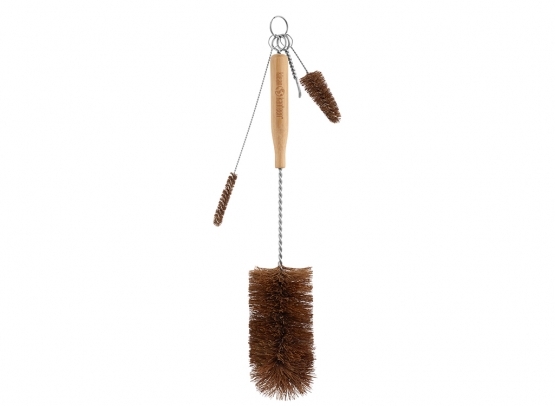 Includes a bottle brush with bamboo handle, cap brush, straw brush and gasket tool. Ideal for cleaning Klean Kanteen bottles and wide mouth bottles. The Klean Kanteen 4 Piece Bottle Brush Set is the all-natural and plastic-free way to maintain and extend the life of your Klean Kanteens while being kind to the environment. This simple cleaning solution is made with just three ingredients, plant-based fan palm fibre bristles, sustainably harvested bamboo and 18/8 stainless steel. With a host of small and convenient tools, this set includes everything needed for cleaning bottles, even the big 64oz bottles, caps, straws and removing gaskets for cleaning or replacement to ensure the longest possible product life. Wash brush set with warm soapy water or diluted vinegar and baking soda before first use and periodically there after.